B. Carlson Heating, Air Conditioning & Plumbing offers commercial plumbing services for businesses of all sized in the greater Albuquerque (ABQ) area. Whether you need fast toilet repair services or to fix a burst pipe before your building suffers water damage, we are the plumbing and HVAC company to call for all of your commercial service needs! To schedule commercial plumbers in Albuquerque, New Mexico, contact B. Carlson online or call (505) 225-3016! Call Our Emergency Plumbers in Albuquerque at (505) 225-3016! When something goes wrong with your commercial or industrial plumbing systems, time can’t go to waste. You need emergency plumbing repair services. B. Carlson’s dedicated plumbing repair team is on hand at all hours and on any day to ensure you have access to the services you need! 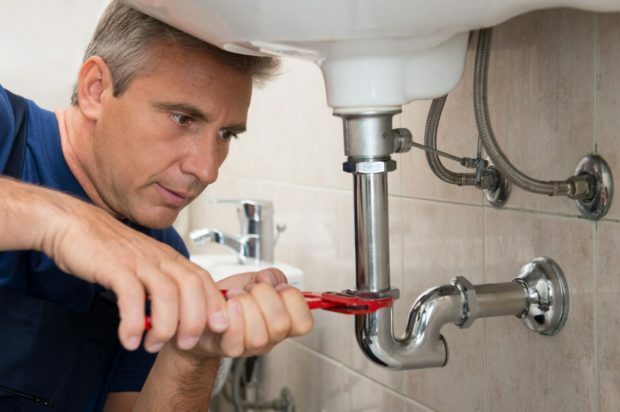 Our certified and licensed plumbing specialists provide the experience, training, and tools necessary to offer you the absolute best plumbing repair or replacement services. We’ve been the name to know for commercial plumbing service in New Mexico for decades, and we’re never satisfied with our service until you are. Looking for expert commercial plumbing services in Albuquerque, New Mexico? Contact B. Carlson online or call (505) 225-3016 for 24-hour emergency plumbing services! Interruptions to your plumbing can put an immediate halt to your company’s productivity. To preserve client satisfaction and employee comfort, your plumbing is vital! B. Carlson’s plumbing repair team can accurately assess your plumbing repair needs to quickly diagnose and solve the problem. The first day your commercial plumbing systems are installed is crucial. A precise and professional installation means years of reliable service, less complications, and the maximum benefit from your plumbing investment. That’s why our superior plumbing specialists take the task of installation very seriously, offering expert service that aligns with your business’s unique needs. For all of your commercial plumbing installation or replacement needs in the Albuquerque area, call B. Carlson at (505) 225-3016 or contact our plumbers online! B. Carlson is a proud supplier of Moen bathroom equipment, including bathroom faucets and showers. Moen products are installed with your relaxation and comfort in mind. If you are working on a new construction or renovation project and want to install superior products, consider installing bathroom fixtures by Moen. The secret to an effective, healthy plumbing system lies in routine maintenance. Your drain systems deal with constant buildup from minerals, soap scum, waste materials, and more—and that’s what leads to most of our repair calls. That’s why our plumbing specialists offer complete, routine drain cleaning, along with our plumbing repair and installation services. With our team on your side, you’ll see fewer clogs, better drain flow, less sewer line complications, and your plumbing system investments will last far longer. For your convenience, we provide plumbing repair services in Albuquerque and the surrounding areas of Bernalillo, Corrales, Los Lunas, North Valley, Rio Rancho, Sandia Heights, and South Valley. For comprehensive commercial plumbing services in Albuquerque, contact our team at (505) 225-3016 to schedule your service!